Twice, I’ve been looking out the window of a tall building in Shanghai and turned to J. and wondered aloud what it would be like if the building just fell over. I was joking of course, but the scenario was inspired by my fear of both heights and shoddy Chinese construction. 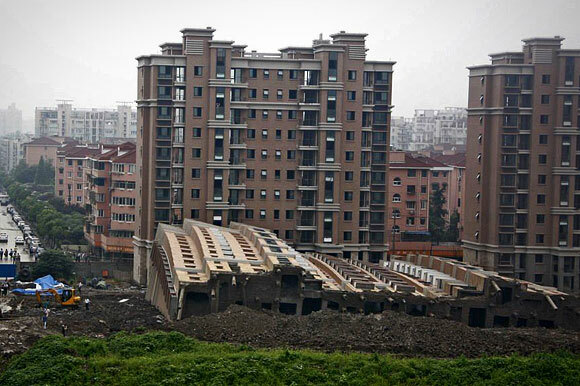 At around 5:30am on June 27, an unoccupied building still under construction at Lianhuanan Road in the Minhang district of Shanghai city toppled over. One worker was killed. 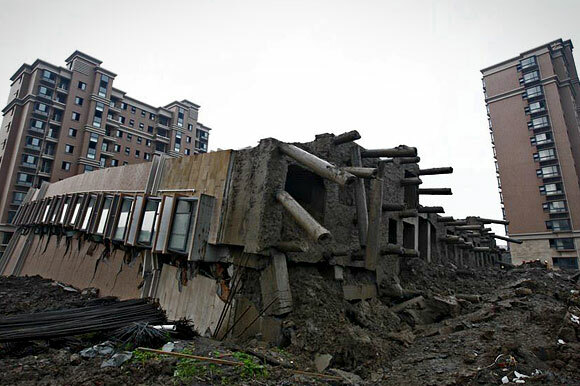 According to information, a 70 meter section of the flood prevention wall in nearby Dianpu River might have something to do with this building collapse. Such a tall building lying mostly intact on its side feels a bit like an optical illusion. If the site wasn’t so far away, I would go see it in person. But by the weekend, the structure will probably be skeletonized. Construction crews might not always achieve solid verticality, but they can certainly build or strip a building quickly. Luckily, the building wasn’t occupied. 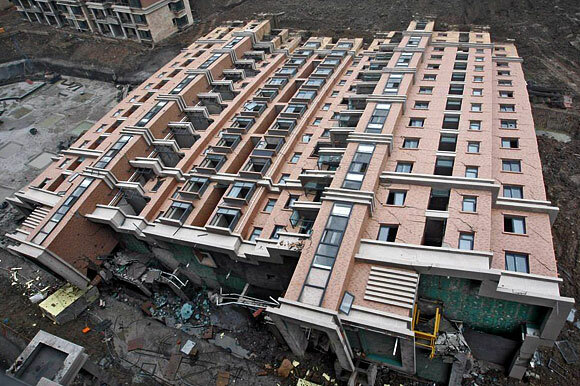 Nor was it built close enough to cause the eleven other identical towers to fall over like a massive row of dominos. As I go to sleep tonight, I will try not to dream of toppling corporate apartments. For more details, there’s a decent post on The Wall Street Journal. *Photos from what appears to be a first hand source at http://cache.daqi.com/view/2617990.html. There are a few more shots of the fallen building there, but all the writing is Chinese.